Having close friendships is one of the healthiest and most important parts of living a meaningful and fulfilling life. When we have close people who we can rely on for emotional support or can call after we have had a rough day, it makes everything feel more manageable. No matter how tough of a time you are having, if you have a close circle of people who you have your back, you are less likely to feel alone and isolated. Having close social support makes us feel that we belong to a network and a community, which therefore helps us to feel more accepted and supported. When people do not have a close circle of friends or have a sense of community, they are at a higher risk for depression, anxiety, as well as self-harm. A major theme in my work with individuals and couples in therapy is talking about relationships, not just romantic relationships, but also friendships, families, and even colleagues. How we act and communicate in important relationships can make a huge difference in our lives. It is important that we communicate our feelings and our perspective in all of our relationships, especially our friendships. When meeting a new client for therapy, one of the first questions I ask them is how their social support is. I unfortunately sometimes hear clients describe having limited social support or feeling disappointed by their circle of friends. When we feel unsupported or disappointed by our close friends, it can cause stress and take a toll on our self-esteem. Once you’ve had a productive conversation that feels like healing the relationship is possible, it is then time to take action and work towards improving the relationship. You may need to take more initiative to plan seeing your friend or to reach out to them to see how they’re doing. Ideally, this effort will be reciprocated by your friend. If you begin to notice over time that you are putting in more effort into the relationship than your friend is, it may be time to adjust your expectations of the friendship. 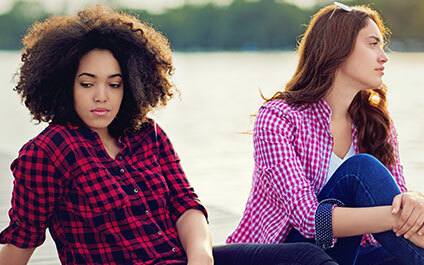 When clients talk to me about feeling disappointed by their friends being unresponsive or if it seems that their friend does not want to participate in the friendship anymore, I encourage my clients to rethink how they see the friendship. I ask my clients to envision all of their friendships and close relationships as if they were on a totem pole. The top portion of the totem pole is designated for your top closest people, such as your partner, immediate family, and perhaps a best friend or two. The top people are your go-to support system and safety net when things get tough. You have high expectations of those relationships, and ideally, you put a lot of effort in them. As you work your way down the totem pole, you include relationships that are important, but have different expectations. If they bail or flake on a plan, you may not be as hurt as you would be had it been someone higher on the totem pole. Friendships may change over time, and friends may go up and down on the totem pole. It is important to communicate your feelings and needs in your relationships, as well as set appropriate boundaries and expectations. If you are having trouble navigating your close relationships and friendships, it may be useful to talk to a therapist about it. Contact Symmetry Counseling to set up an appointment with an individual, couples, or family therapy to discuss your concerns.